The “Road to Nowhere” is a paved road that runs from Steinhatchee for 12 miles nearly all the way to the Gulf of Mexico. 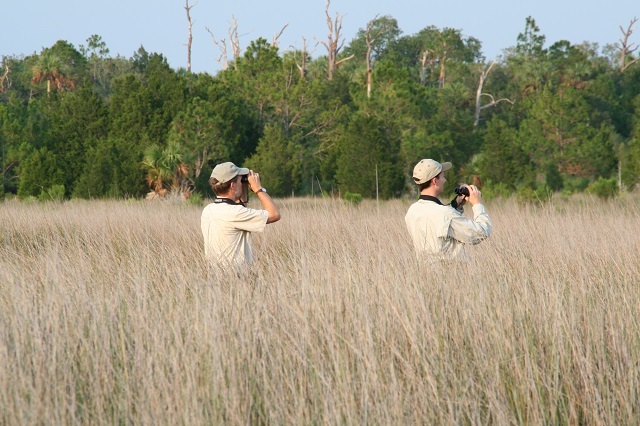 Birders and wildlife watchers will want to explore the southern end (the last 6 miles) of the road, which skirts along the eastern boundary and eventually terminates inside the Big Bend Wildlife Management Area’s Jena Unit. From the road margins, scan the pools and tidal creeks for wading birds. Check the flats for shorebirds like Red Knots and Marbled Godwits. The black needle rush marsh plays host to the elusive Black Rail. Listen for them singing in March and April; early morning at sunrise is best. A bridge over a tidal creek near the road’s terminus is a good place to look and listen for Clapper Rails, which are lot easier to see and/or hear than their smaller relative! Butterfly viewing can be very rewarding here. Look for Great Southern White, Palamedes Swallowtail, Whirlabout and Delaware Skipper. Much of the adjacent land along the road is privately owned, so be careful not to trespass. Also beware of the soft road shoulder and traffic. Boat ramps are provided along CR 361 at Sand Ridge Rd., Rocky Creek Rd. and Sink Creek Rd. ; they provide access to the Big Bend Seagrasses Aquatic Preserve and the 105-mile Big Bend Saltwater Paddling Trail. Look for wading birds at the Sink Creek Rd. boat ramp. Seasonal hunting takes place at this site, please click here for details.